Why you should choose our MoYag Lawn Aerator Shoes? Grass is a living thing that needs air and water to grow. Regular mowing and other outdoor activities in the garden during the summer months lead to compaction in the surface layer of the lawn. Drainage is impeded and it is harder for water , air and fertiliser to penetrate to the roots. The lawn aerating shoes provide a fast and efficient way to keep your lawn aerated, helping the lawn to breathe and take in essential nutrients. 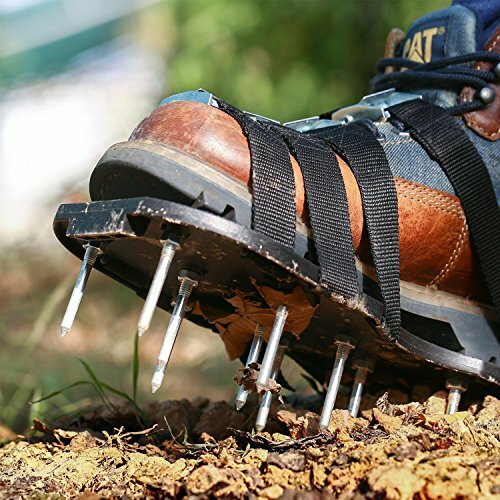 The 13 pcs 57mm (2.2") spikes on each shoe provide deep and even aeration. Best used as part of your lawn care routine in Spring and Autumn. For best results, use when the ground is soft. Do not use on stoney or uneven ground Very quick to assemble. Spare parts available. 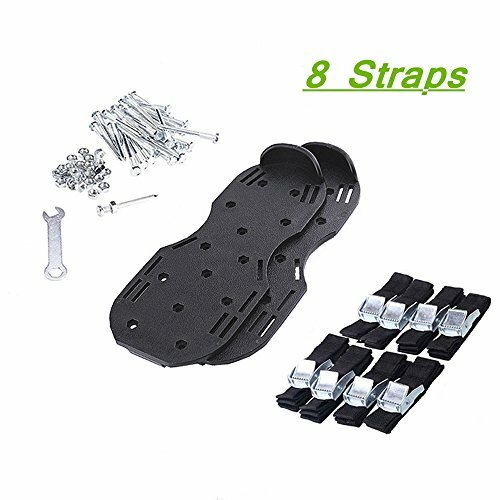 - Straps for a pair of lawn aerator shoes (8 PCS), a set of screws (26 - PCS), a wrench, and a manual. - Suitable for grass, gardens, courtyards, floors. It's also intended for the construction industry. 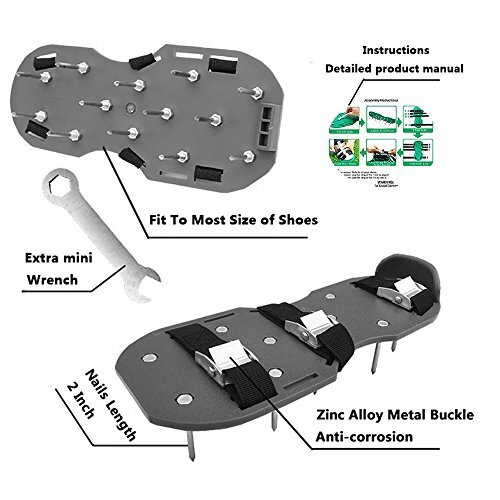 - With the zinc alloy buckle that makes shoes more stable and durable. - Specialized anti-slip pattern on the upper for the increased reliability and safety. 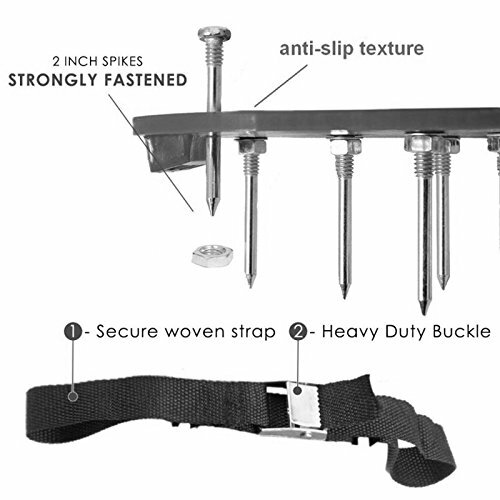 - The provided wrench allows you to install easily. 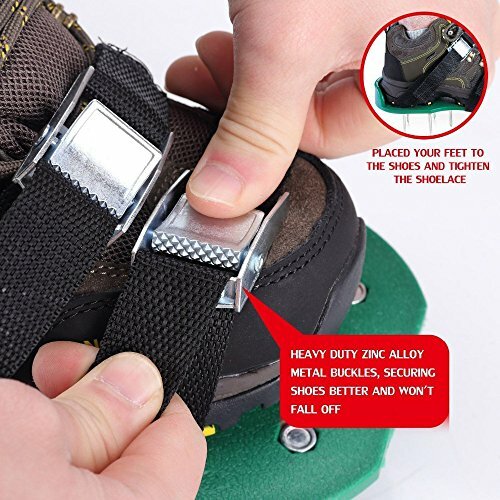 【HEAVY DUTY QUALITY】The Lawn aerator shoes are made up of a sturdy plastic base which provides a good heel support,4 adjustable straps with strong metallic buckles. 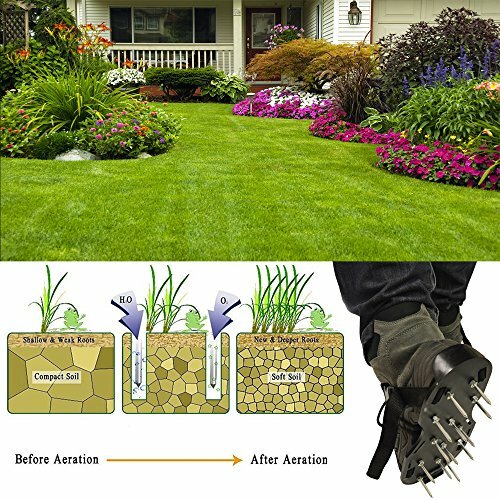 【KEEP YOUR LAWN OXYGEN 】I would recommend to wall on your lawn after rain, especially heavy rain, because the ground is so soft and the needles go in so smoothly and easily. It will change the quality of the lawn since the roots will get more oxygen and room to expand. 【UNIVERSAL SIZE】The aerator shoes can fit anyone,and you can secure the sandal firmly to your regular shoes. 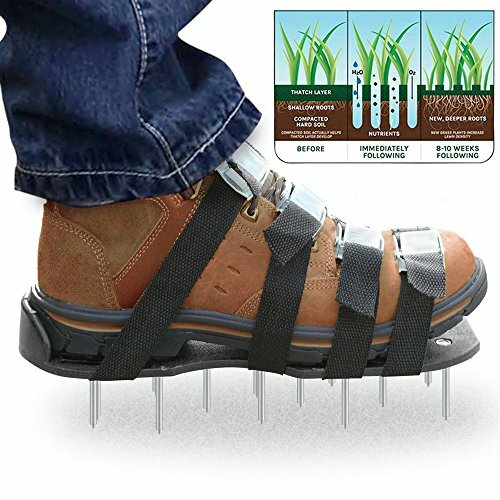 【CHEAP,USEFUL,EASY】With the lawn aerator shoes,you don't need rent any expensive aerator machine, or wast time with an annoying hand lawn aerator.You can wear the aerating shoes make the lawn as you wish. 【OUR GUARANTEE】 We are committed to creating the best customer service for our customers. We promise 100% full refund if you are not satisfied with your Lawn Aerator Shoes within 36 months. If you have any questions about this product by MoYag, contact us by completing and submitting the form below. If you are looking for a specif part number, please include it with your message.